From the island of Mull, the mad three went by ferry to Ulva, where we took a boat ride to the Isle of Staffa and around Tresnish Isles. Below are a few of my pictures from the trip. As usual, click on the pictures to see the larger view. 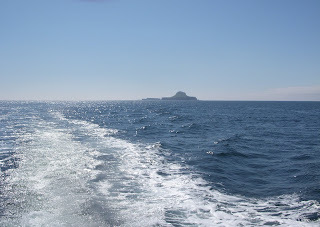 The "Hoy Lass", our boat to the islands. The sign in the loo, which I could not resist documenting for its cleverness and humor in strongly making its points. 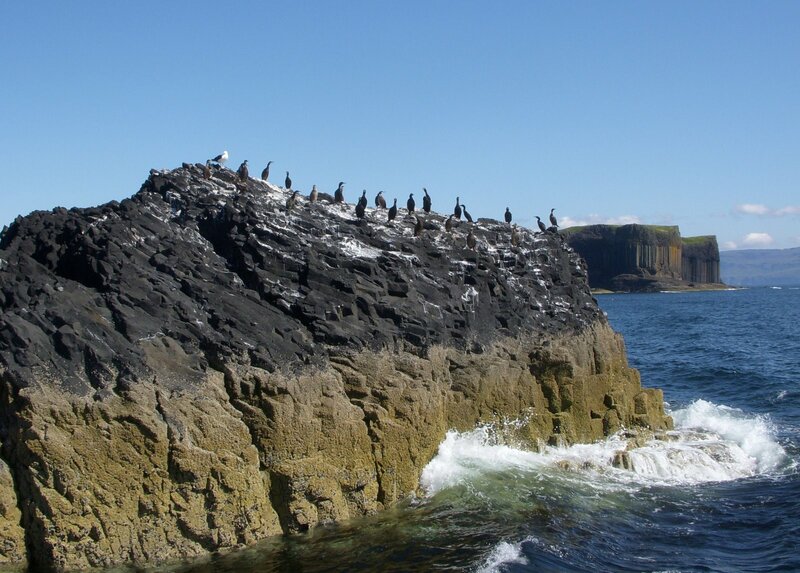 Cormorants and one sea gull on a rock. 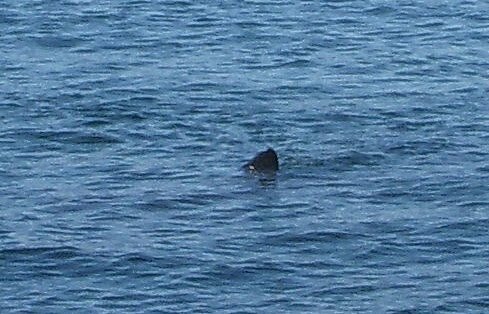 The fin of a basking shark. Gorgeous scenery along the way. The view from on high on the Isle of Staffa. Fingal's Cave from Cathy's Facebook pictures. I did not make the descent to the cave, because the way looked tricky for an old lady. Cathy and MadChauffeur went and said it was wonderful. Now I wish I had gone. If you are a Facebook friend of Cathy, you can see several sets of great pictures from our travels posted there. 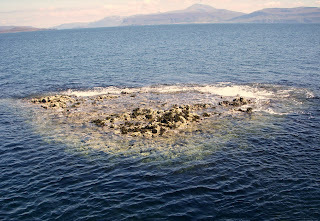 A rock pool near Staffa, which I found enchanting. The wake of the boat as we made our way back to Ulva. All arrangements for the excursion were made by MadChauffeur. He seemed to thoroughly enjoy being IN CHARGE throughout the entire time he traveled with Cathy and me. 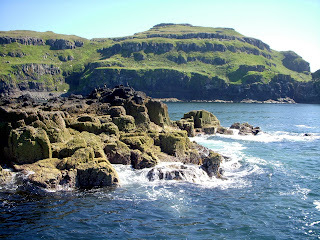 We loved our trip from Iona to Staffa - the cave is amazing. Path to cave. Yes - probably good you did not take it. Ann, I'd never have made it. Vertigo would have kicked in. 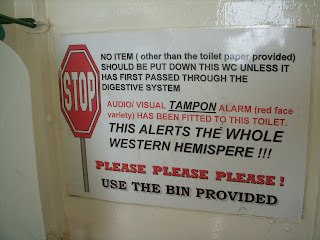 I'm glad I didn't try. Your pictures are lovely especially the pictures of nature. Like you I so enjoy the natural world. 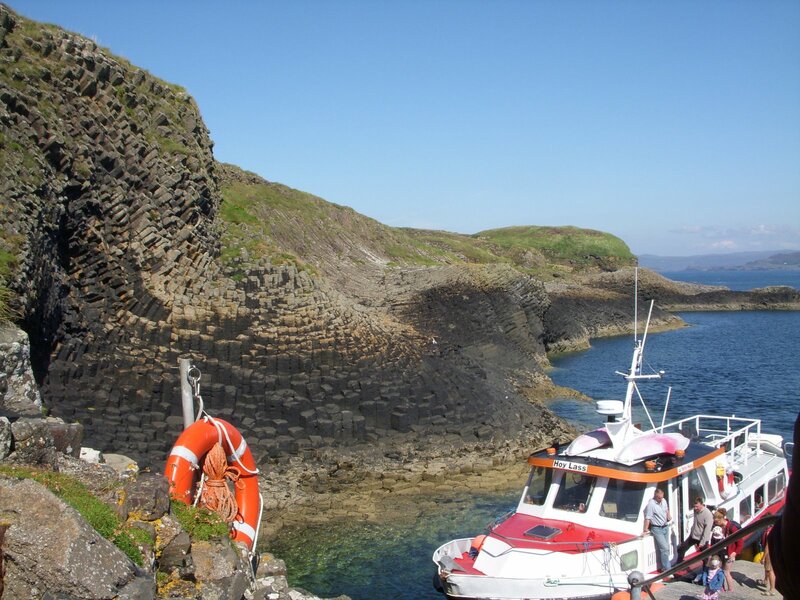 Fingal's Cave is like the Giant's Causeway on the north coast of County Antrim in Ireland! Ciss, thank you. My pictures came out better than I expected. 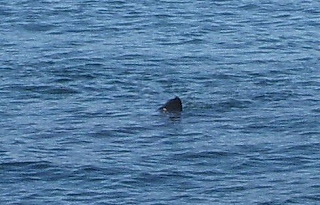 My digital camera is not fancy or expensive, but I'm pleased with the results from this trip. JCF, only once did it rain the entire day, the day we visited Iona. Other times, we'd have rain for a while, and then it would stop, and the sun would come out. MadChauffer got a suntan - in Scotland! The weather was quite changeable. I love the cormorants - thanks! 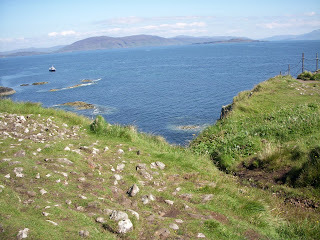 The day we went to Staffa - the sea was flat - the sky was blue. Lovely. Tim, you're quite welcome. It was lovely to see the birds lined up on the rock. Ann, the weather was fine for us, too. MadChauffer got a suntan - in Scotland! Irritatingly, having made all that fuss about the issue, MadPriest looks like a bronzed god in the couple of photos Mimi and I managed to get him to grumblingly sit still for - the very picture of tanned good health (ironically). Whereas Mimi and I look white-faced and scared. Though the pace he drove down the single-lane roads may have something to do with that. BTW Mimi, that's not me favourite pic of the ones I took of Fingal's Cave - I like the ones from inside looking out much better, or the one of the ceiling. But then they don't really let you see the cave. The camera used a flash on that one when I didn't want it to. I love the cormorants. All of the birdies and other wildlife kept helpfully lining up very nicely for us wherever we went. We did have fabulous luck with the weather. 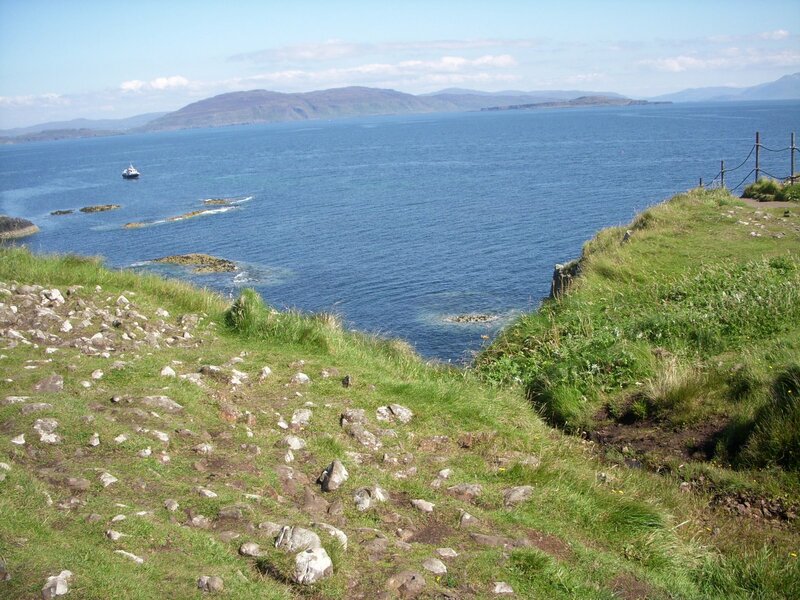 I've always had good luck with the weather in Scotland, and it's so beautiful when it's sunny. Maybe taking it a bit far, Cathy? I'm just asking. The speed of our ride made me yelp a few times when it was my turn in the front seat, although yelping was banned. I couldn't help myself. Cathy is an enthusiastic wildlife photographer. In fact, "enthusiastic" may be putting it mildly. That's wot I said at the time, I said I was going to say it somewhere in the commentary about our travels, and now I have. Also, Mimi, you complimented him at least as extravagently, as I recall. I did like the wildlife photography bit and am seriously thinking about taking it up as a hobby. Folks, you can't imagine the number of rules that were imposed on us by MadChauffeur. That, along with his many efforts to "fix me", were nearly my undoing. He seems to think Cathy is fine just as she is, but I need lots of work. Trip to Staffa was not on for me because of storm the day before. Everybody says it's wonderful. Not sure I would have tried the path either, at least not without a walking stick. Amelia, I'd think landing would be quite difficult in bad weather. We were blessed in the weather, but for our day at Iona. I knew that I would probably never return to the island, so I carried on in the rain. hey JCF, you know you asked Mimi to kiss me and slug that Mad Priest? Well she did the first, twice! And she did the second too, verbally at least - he got what was comin' to him, I'm tellin' ya now. Well she did the first, twice! And on the lips, too! No pics, though. Who ya gonna ask to take a picture? The station master? Cathy, you're telling all my secrets. You must be at the single malt bottle again. Actually now you mention it, Mimi, I have just opened the 15-year Tobermory, and I can report back that it is very fine. Cathy, excellent. Enjoy! I won't mention the single malt bottle again, for, as of now, we all simply take for granted your happy hours.